Walgreens is still out of Nivea Bodywash again! :$ & Pert Plus! 1 - Walgreens Acid Control ($7.99) will get $7.99 + 10% after ESR = FREE! 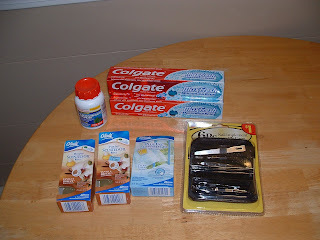 2 - Colgate Max Toothpastes ($2.99) used $2/1 in ad coupon and two $1/1 of any colgate from last week's paper. = FREE! 2 - Glade Plug ins refills ($1.99 ea) used a B1G1F coupon, a $1/1 MFC, and will submit for ESR ($1 ea + 10%) = FREE! 1 - Glade Plug in refill (different than above)($1.99) used a $1/1 MFC, and will submit for ESR ($1 + 10%) = FREE! *I looked at the Pantene Deal but my coupons had magically disapeared and I really didn't want to have to try that hard. Maybe next time.